It’s a basic move in freestyle wrestling: a sudden step forward while dropping to one knee. If you saw a man practicing this action alone, during warm-ups, you’d almost imagine he was sweeping into a low bow before an invisible lord. Watch the same move in a match, and you’ll see it flow into a lunge that knocks the opponent to the mat. For a split second in the choreography of wrestling, aggression can be indistinguishable from submission, violence from courtesy. Stretch that blink of an eye into several years of narrative time—a bit longer than two hours on the screen—and you have the ambiguous tension that drives Foxcatcher. Directed by Bennett Miller from a screenplay by E. Max Frye and Dan Futterman, Foxcatcher is a fictionalized account of the catastrophic interplay between two Olympic champion wrestlers, the brothers Dave and Mark Schultz, and one of the wealthiest men in America, John E. du Pont. Perhaps you’ll recall an outline of the facts from reports of the murder trial. In the late 1980s, around the time he turned 50, du Pont decided to convert a part of his family estate in Pennsylvania into a training facility for wrestlers. He sponsored US amateurs for international competition (calling the athletes he’d collected “Team Foxcatcher,” after the name he’d given the property) and also took up the sport himself, sometimes entering senior matches and sometimes sparring with his facility’s much younger, semi-dependent residents. In 1996, this late athletic career came to an end when du Pont abruptly rolled up to Dave Schultz, who had been living at Foxcatcher, and without warning shot him dead. No motive was ever discovered. Miller stays true to life in Foxcatcher by declining to explain the murder, perhaps because it’s the part of the story that interests him least. Another filmmaker might have used the old noir device of starting with the gunshots and then telling the story in flashback, so the killing would take on the significance of something that had been fated. In Foxcatcher, though, the only fate is that of entropy, which sends the main characters downward in a three-strand spiral, even as they pursue world conquest in sports and boast (in du Pont’s case) of national renewal. To Miller, murder is just one more damned thing that happens in a story filled with dread but no suspense: a fable of the misunderstanding, heartbreak, irony and absurdity that can abound in America when two social classes grapple in mutual desire and animosity. 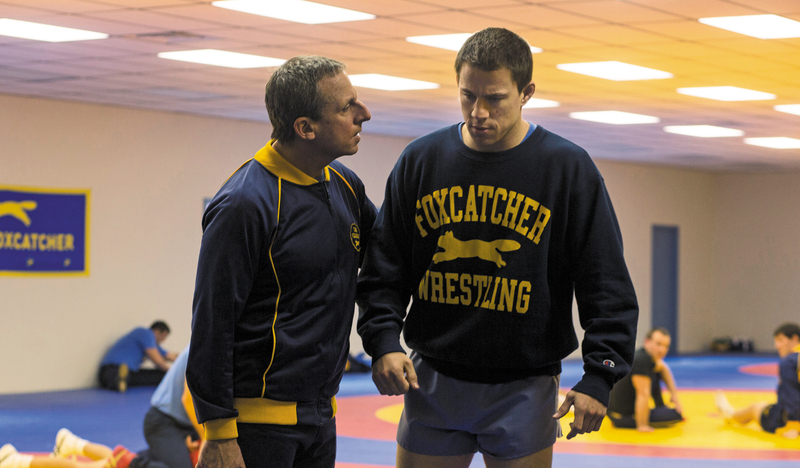 To be fair, family life in Foxcatcher also has its push and pull. As the movie begins, in the late Reagan era, you see Mark deliver an uplifting speech about hard work and persistence—it might have been uplifting, anyway, if the kids in the grammar-school auditorium hadn’t been so sparse, and if Mark hadn’t seemed to begrudge them the words that he drags out of memory, one by one—after which he collects a paycheck of $20, made out incorrectly to his older brother. It’s a painful way to introduce a gold medalist; and as Channing Tatum plays him, you already notice the hurt in Mark’s unsmiling gaze, the anger in his jutting lower lip, the brute force pent up in his side-to-side gait. By the next scene, when Mark goes to the gym to be coached by Dave—a bearded and bespectacled Mark Ruffalo—you’re already primed for him to rear up and smash into his brother’s face. (Does Mark mean to cause harm, or is the attack merely misjudged? Impossible to say.) But you might not expect the workout to begin as it does, almost like one of the groping slow dances that this college gym must sometimes witness. The brothers embrace, caress, drape their heads over each other’s shoulders. When Mark draws blood, the perpetually calm and kindly Dave simply wipes it away with a swatch of his white T-shirt. If there’s a locked-in, sweaty love between Mark and Dave—complicated on Mark’s side with resentment at being the junior Schultz, the one who’s apparently jobless, the bachelor brother who eats his meals of slop alone at a bare table—there’s nothing but cold air and disdain between John du Pont and his aged mother. Though you’re made to understand that the mother (Vanessa Redgrave) continues to rule the family estate and her middle-aged son with it, she does so from a deliberate distance—one that’s difficult to gauge, because Miller never allows you to grasp the layout of the property or even figure out the configuration of the main house. Like the lower-class characters, you know only that the lawn outside the front door is big enough to handle a helicopter, as seen when du Pont first summons a puzzled Mark to Foxcatcher to propose a residency. An aide tells Mark that the mother is out there somewhere and must not be spoken to, but for the most part she remains an unseen presence, all the more chilling in her disapproval for being remote. No wonder there’s a false note from the start in du Pont’s lord-of-the-manor posturing: the way he slouches too far into the sofa cushions when he interviews Mark, undermining his show of being relaxed, or tilts his head back as if peering down at a subordinate, only to make himself look as if he’s coping with stuffed sinuses. An extraneous irony of this tale of the search for competitive glory is that so much of its publicity has focused on the Oscar-worthiness of Steve Carell’s performance as du Pont—or, I’m tempted to say, the performance of the makeup artists and costumers, who have made Carell almost unrecognizable. He really does justify all their work, playing du Pont as the most preening and yet sadly awkward figure in a movie that’s obsessed with physical expression. (Just as successfully, if more predictably, Carell also catches every nuance of du Pont’s dialogue: the solemnly hilarious self-aggrandizement, the flattery that can turn in a moment into vitriol, the grandiloquence about being a renovator of America’s moral fiber.) But the less ostentatious metamorphoses in Foxcatcher seem to me just as praiseworthy: Tatum’s transformation of himself, with only a few adjustments of his carriage, into Mark, who seems so dangerous at first and proves to be so vulnerable, and Ruffalo’s channeling of his fundamental repertoire as an actor—dignity and intelligence—into a specific and fully grounded realization of Dave. He’s the man who can’t be bought—or at least that’s what Mark thinks about his big brother, until du Pont proves him wrong. At heart, Foxcatcher is about Mark’s disillusionment, after entering a world much bigger than any he’d imagined, at seeing it shrink his brother. It’s about Dave’s tragically false belief that when he sells himself, he does it mostly to help Mark, with only a manageable degree of compromise; and it’s about the not-so-secretly vicious rage of du Pont at failing to demonstrate, at all times and in every way, the superiority he feels ought to have been his birthright. Probably the best moment in du Pont’s life, according to Foxcatcher, comes when he walks Mark Schultz into the gym he’s built on the estate, and Mark, awed and excited, instinctively throws himself into a warm-up. He steps forward suddenly while dropping to one knee. It’s the first time that Mark seems to bow before du Pont; but the match, with its many falls, is just beginning. One of the many pleasures of Gabe Polsky’s bright and bouncy documentary Red Army, about the fortunes of the Soviet Union’s premier hockey team and its players, is the casual disregard shown to the eager filmmaker by the central figure and principal interview subject, Slava Fetisov, who was for nine years the captain of the Soviet national team. As the graphics explain, cascading down one side of the screen and then, having run out of space, spilling down the other, you are looking at a man who won two Olympic gold medals, two Stanley Cups, seven world championships, fourteen Soviet championships and the Order of Lenin, as well as having an asteroid named for him. Now handsome, well-tailored and prosperous-looking in middle age, Fetisov is not someone who feels the need to interrupt a cellphone call just because Polsky is waiting with the camera running. To a meek offscreen plea to begin the interview, he gives no more attention than is needed to flip the finger. As you soon learn from Red Army, there is much more behind this superb indifference than the complacency of a winner. Fetisov was born into the poverty and ruins of the Soviet Union after the Great Patriotic War—a setting called up through Polsky’s ample and fascinating use of archival footage—and fought his way as a child into the national hockey training program using equipment that his parents had bought on the black market with 250 painfully saved rubles. Trained by the brilliant, creative and fatherly coach Anatoli Tarasov, then later abused by Tarasov’s KGB-affiliated replacement, who kept the squad locked in camp for eleven months out of the year, Fetisov and his teammates were required to be more than just athletes: they were living proof of the superiority of the Soviet system. If they fell short, there were consequences. And when a crumbling Soviet Union needed hard currency, they were available to be indentured, one by one, to the National Hockey League. Only Fetisov refused. He held out in dire circumstances, enduring harassment, beating and a face-off with the minister of defense, until he won a visa—the first granted—that allowed him to play in the United States without kicking back most of his salary. And then the struggle continued—because in the individualistic culture of the NHL, there was none of the teamwork that Fetisov was used to, and none of the artistry, but only set plays and fistfights. Apparently, there really had been some superior aspects to the Soviet system, and now he was shut out of them. A thematically ambitious film with a genial and even joking manner, Red Army usually keeps the mood light, with animations of Soviet-era posters, shots of colorful (and purely imaginary) trading cards of Red Army players, and soundtrack music that might have suited Danny Kaye in his Slavic mode. True to the tradition of sport documentaries, it’s structured to be the story of a triumph, featuring a main character who has the swagger of not just a survivor but a victor. Polsky knows enough to send you out of the theater with a smile, won at his own expense if necessary. But he also knows there are implications to this tale that go beyond the sport, and nuances that are absent from clichés about Soviet life. Like the high-speed weaving and passing of the Red Army team, his movie is fun to watch, but actually very complicated. In the competition to be mentioned as an Oscar contender, the fine young English actor Eddie Redmayne is currently vying with Steve Carell in the based-on-a-true-story and hidden-by-makeup category for his role as Stephen Hawking in The Theory of Everything. You might think that Felicity Jones would attract just as much attention in the part of Jane Hawking, given that the film is about the Hawkings’ marriage first and science only second. Jane must be an extraordinary woman to have devoted herself to Stephen for so many years, having known about his illness from the start. As it happens, though, the role is so underwritten that you might think the screenplay was credited to MetLife. You’re left only with the wig on Redmayne’s head, the big eyeglasses, the tortured-genius mannerisms (My Two Left Feet, they should call this one) and James Marsh’s direction, which takes the easy solution to every scene. It’s a creative innovation, I suppose: frictionless filmmaking for a movie about physics. If you want a real step into the intellectual void, though, you’d better save yourself for Interstellar, Christopher Nolan’s latest exercise in devising narrative lines that run laboriously in different locations and on multiple timescales to no great effect, other than to tell you that love will find a way. Matthew McConaughey, asked to use little of the depth, power and wit he brought to Dallas Buyers Club, defaults to Gary Cooper manliness as a corn farmer in a dystopian future. The character is even called Coop; and like that slim, laconic hero, he does what he has to do, piloting a strangely blissed-out Anne Hathaway through a black hole in search of a new home for humanity. Left behind is his young daughter, whose plush lips tell you she will grow up to be Jessica Chastain. Nolan intends to wow you with sheer magnitude—Interstellar heaps up mountainous dust storms, mountainous waves, mountains of ice—but his small thinking can be summed up in Coop’s onboard robot companion, called TARS. It looks something like the monolith in 2001: A Space Odyssey, only it’s shorter than Coop, sometimes walks around like a metallic Tinkertoy and tells corny jokes. In Kubrick, humans carried their convention-bound minds into an indifferent grandeur. In Nolan, the symbol of that grandeur has been brought inside and domesticated—and like the movie, it goes clunk, clunk, clunk.